Uniquely styled, the Calista diamond ring sparkles with 5 equally sized brilliant cut diamonds. Each diamond is held within an ornate 'Chalice' styled setting, crafted in warm, luxurious 18ct Rose Gold. The Calista Rose Gold Diamond Eternity Ring, shines with the breathtaking beauty of Diamonds—combined with the warmth of 18ct Rose Gold. 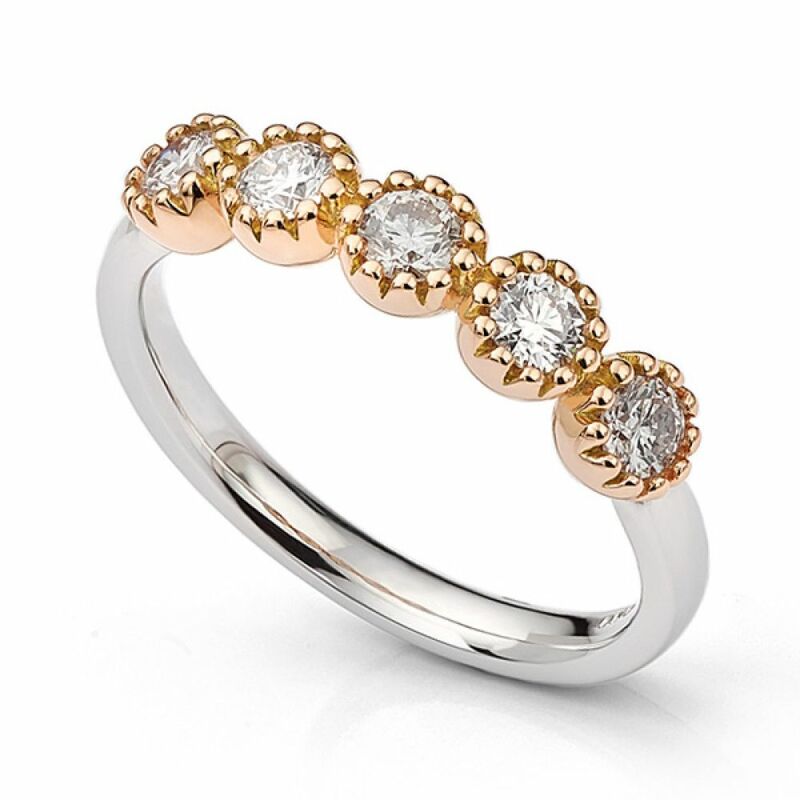 Crafted to order, this elegant five stone ring holds five equally sized Round Brilliant cut Diamonds. Measuring 3mm in diameter, each Diamond is held within a a micro-claw chalice styled setting. With a combined Diamond weight of 0.50 carats, each Diamond is graded to exacting standards for both whiteness (G Colour) and clarity (SI1 Clarity). With the warm, pinkish hue of Copper, the Calista design contrasts with the comfortable 18ct White Gold band. Your ring will be crafted to order over 4 weeks before it is delivered in luxurious Serendipity Diamonds packaging, neatly boxed and beautifully presented. Please contact us if you have any questions or if you require any guidance on any aspect of your purchase.